New technological developments by UNIST researchers promise to significantly boost the performance of lithium metal batteries in promising research for the next-generation of rechargeable batteries. The study also validates the principle of enhanced battery performance via the real-time in situ observation of charge-discharge cycling. Lithium metal batteries are a type of rechargeable battery that has lithium as an anode. Among a number of different cathode materials, lithium metal has the lowest driving voltage and boasts about 10 times more capacity than conventional graphite anodes. Therefore, it has been gaining much attention as a potential next-generation anode material for electric vehicles and large-scale energy storage systems. While lithium metal anodes represent an ideal candidate for high energy density batteries, their use as anodes in commercial cells requires more development. For example, lithium metal tends to grow into dendritic structures during the continuous charging/discharging processes of a battery, which may result in poor performance. This is because this dendritic structure on the lithium metal surface layer triggers internal short circuits by piercing through the battery separator. 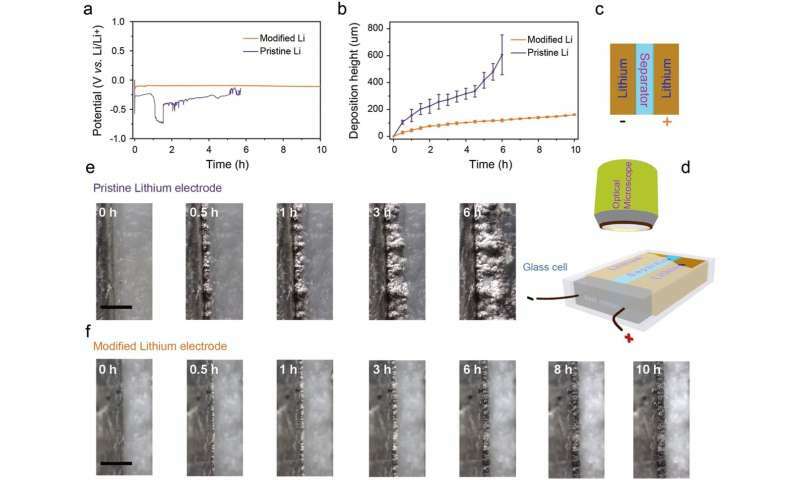 In the study, the research team suppressed dendritic growth by coating the lithium foil with a lithium silicide (LixSi) layer. Results showed excellent electrochemical performance in terms of rate capability and cycle stability. 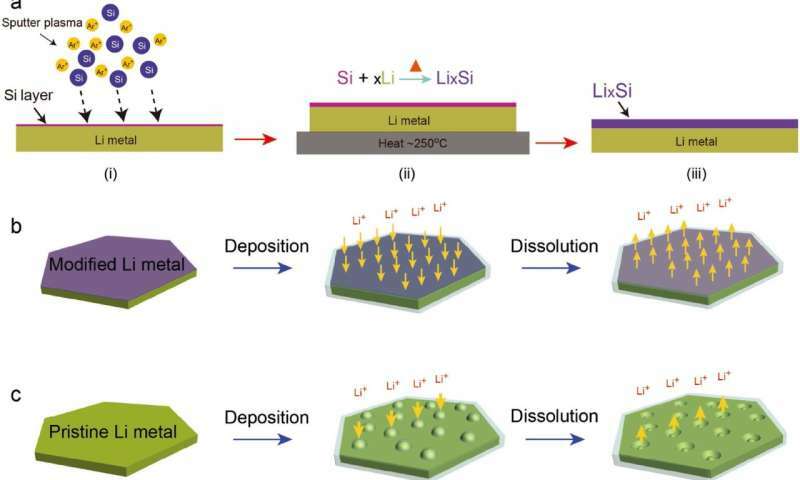 In situ optical microscopic observation was also carried out to monitor the electrochemical deposition of lithium on the LixSi‐modified lithium electrodes and the bare lithium electrode. It was observed that a much more uniform lithium dissolution/deposition on the LixSi-modified lithium anode can be achieved as compared to the bare lithium electrode. "Our study provides direct observation of electrochemical behavior, volume expansion, as well as the lithium dendrite growth of lithium metal anodes," says Professor Lee. "Applying this in real batteries will also help contribute to the commercialization of lithium metal batteries." This research has been published in Advanced Materials. I am grateful for all the work people are doing on lithium batteries. They will make better and better batteries. But does one ever wonder why there are probably 100 papers on improving batteries, to one actual improvement in battery production. does one ever wonder why there are probably 100 papers on improving batteries, to one actual improvement in battery production. There's a LOT more to getting stuff into production than just making a lab prototype. - able to be mass produced by either roll-to-roll or large batch processing. If you have long curing or many layer processes (which increase the amount of the product that will fail testing) then that is a no-no. Also if the advantage is only slight over de-facto standard then factories aren't going to spend the enormous investment retooling everything. However, you never know which one of the myriad of improvements (or which combination) will be the next big thing. The more such improvements are published the more the chance for someone to stumble upon a viable combination. You can't just say "research me the next battery". That's not how it works. It drives me crazy, being unable to credit whoever said this originally. A physicist was asked why batteries are all so crappy. And he? replied. "You have a choice. You can have a Universe where natural laws allow for perfect batteries. And make biological life impossible. Or, you can have a Universe where biological life is possible. But the natural laws dictate energy storage by batteries will always be crap! No matter how much we 'perfect' them."